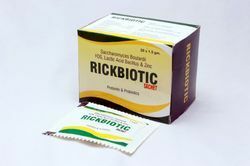 We are a leading Wholesale Trader of rickbiotic- pre & pro biotic sachets and calcirick-d3 from Roorkee, India. With the aid of years of understanding of this domain, we provide clients with the superior quality of Rickbiotic-Pre & Pro Biotic Sachets. Procured from trusted source of this domain, the biotic sachets helps in regeneration of bacterial flora in the gut. Moreover, the biotic sachets minimize the number of pathogenic bacteria in the gut. Save gut from the attack of pathogens ! ! Dexterous professionals have helped us in presenting our customers with the superior quality of Calcirick-d3. Used to reduce bone fracture and fall by 22%, the calcirick-d3 is procured from trusted vendors. The calcirick-d3 lowers inflammatory process and builds muscle strength. 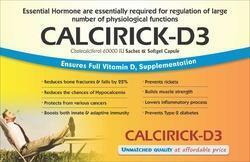 Moreover, the calcirick-d3 prevents rickets and prevents type-2 diabetes. For regulatiopn of large no. Of psychological functions ! !